Krypton is one of the six Noble Gas elements (Group 18), which are widely known for their relative "inertness" and difficulty in forming chemical compounds with any other elements, due to these elements having full valence shells. Contrary to original thinking, however, Krypton has been made to react with the highly electronegative elements and is used in lighting and other commercial purposes. Krypton is found in the Group 18 elements, otherwise known as the Noble Gases. In 1785, Henry Cavendish suggested that air contained nonreactive gases after he was unsuccessful in getting a sample of air to react. A century later, British chemists John Rayleigh and William Ramsey began to isolate these inert gases (beginning with Argon) and seperated them in their own group on the periodic table since each of these elements had full electron valence shells. One of these gases, Krypton, was discovered along with Neon and Xenon by Rayleigh and fellow chemist Morris Travers in 1898 in a residue left from evaporating almost all components of liquid air. The name Krypton is derived from the Greek word "kryptos", meaning "hidden". However, the inert quality of these gases was disproved when Xenon compounds were created in 1962 and a Krypton compound (KrF2) was synthesized successfully a year later. This proved that this group of gases is not necessarily inert. Although both Kr and Xe have full valence shells, they are both the most easily ionized of the group. It simply took an element of high electronegativity, in this case Fluorine, to force Xe and Kr to react under high temperatures. It ranks sixth in abundance in the atmosphere. 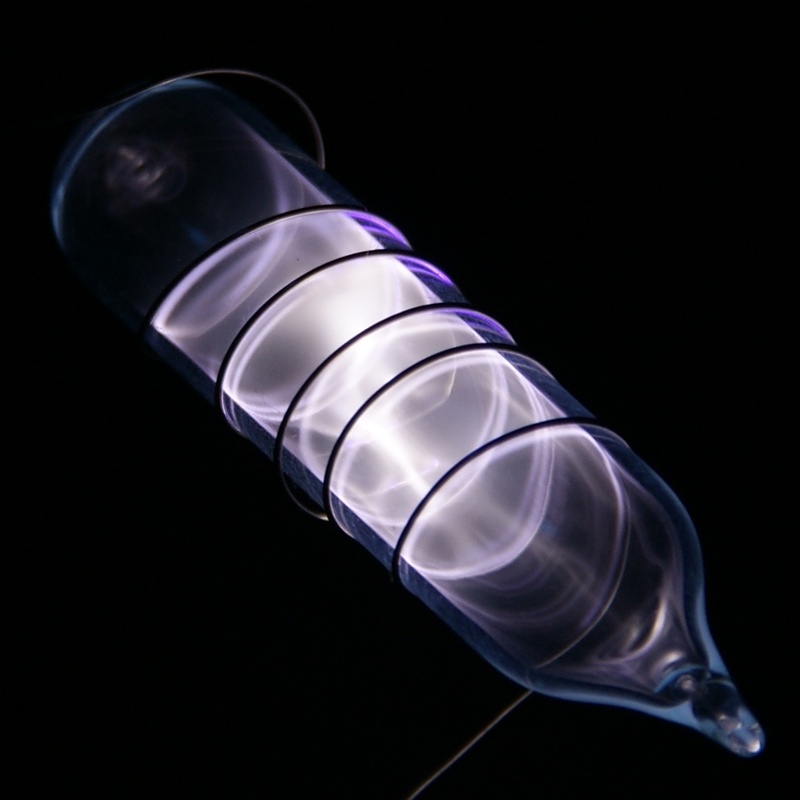 As with the other noble gases, krypton is isolated from the air by liquefaction. Although Krypton is naturally chemically nonreactive, krypton difluoride was synthesized in 1963. It has also been discovered that Krypton can bond with other atoms besides Fluorine, however such compounds are much more unstable than krypton difluoride. For example, KrF2 can bond with nitrogen when it reacts with [HC≡NH]+[AsF−6] under -50°C to form [HC≡N–Kr–F]+. There have been other reports of successfully synthesizing additional Krypton compounds, but none have been verified. Krypton has 6 stable isotopes: 78Kr, 80Kr, 82Kr, 83Kr, 84Kr, and 86Kr. There are a total of 31 isotopes of Krypton, and the only isotope besides the six given that occur naturally is 81Kr which is a product of atmospheric reactions between the other natural isotopes. Krypton gas is used in various kinds of lights, from small bright flashlight bulbs to special strobe lights for airport runways. Due to Krypton's large number of spectral lines, it's ionized gas is white, which is why light bulbs that are krypton based are used in photography and studio lighting in the film industry. In neon lights, Krypton reacts with other gases to produce a bright yellow light as well. The isotope 85Kr can also be used in combination with phosphors to produce materials that shine in the dark due to the fact that this particular isotope of Krypton reflects off of phosphors. Krypton is also used in lasers as a control for a desired wavelength, especially in red lasers because Krypton has a much higher light density in the red spectral region than other gases such as Neon, which is why krypton-based lasers are used to produce red light in laser-light shows. Perhaps one of the most significant uses of Krypton is in the krypton-fluoride laser which is used in nuclear fusion energy research. Yet another important application of Krypton, specifically 83Kr, is in Magnetic Resonance Imaging (MRI), which is used instead of other gases because of its high spin and smaller/less polar electron cloud compared to other noble gases such as Xenon. It is used to distinguish hydrophobic and hydrophillic regions containing an airway. An international agreement was made in 1960 to base the length of the meter on the wavelength of light emitted by 86Kr (605.78 nm). However, this was changed in 1983 when the International Bureau of Weights and Measures determined the meter to be the distance that light travels in a vacuum in 1/299,792,458 s.
How is the element Krypton isolated? Why can fluorine react with Krypton to form a compound? What is the electron configuration of Krypton? What colors are most pronounced in the Krypton spectral emission? How many stable isotopes of Krypton are there? By evaporating the componnts of liquid air. Because fluorine is highly electronegative and Krypton is readily ionizable. Newton, David E. Chemical Elements: From Carbon to Krypton.2nd Volume. Detriot, MI: UXL, 1999. Print. Codd, Sarah L., and Joseph D. Seymour. Magnetic Resonance Microscopy: Spatially Resolved NMR Techniques and Applications . Bozeman, MT: Wiley, John & Sons, Incorporated, 2009. Print. Sykes, A.G. Advances in Inorganic Chemistry. 46. San Diego, CA: Academic Press, 1999. Print.